Tired of just hearing when Microsoft Windows 8 going to release to public? Well its your lucky day. 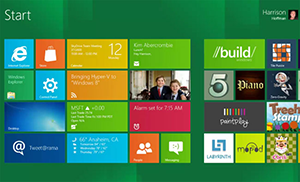 Microsoft Finally released the Consumer Preview version of Windows 8 to public. So now people can just download and have a look what they are getting in this OS and whats the fuss is all about. Download ISO file size is about range from 2.5GB to 3.4GB depending on which version you are going to try. Comes on both 32-bit and 64-bit version. According to Microsoft’s Steven Sinofsky, they’re already bracing themselves from the hordes of Windows 8-hungry users. The servers seem to be coping with the load just fine for right now (thanks for the heads up, commenters), but we’ll see how things progress as more people hear about it. On the other note, Microsoft has also provided users with the necessary system requirements for running the Consumer Preview, and they are just the same as what Windows 7 required. 1GHz processor and DirectX9 or later is a must, the rest of the requirement depends on which version of the OS you would like to run. If you’re a 32-bit user, you’ll only need 1GB of RAM and 16GB of disk space, while those who wish to use 64-bit need at least 2GB of RAM and 20GB available on their hard drives.